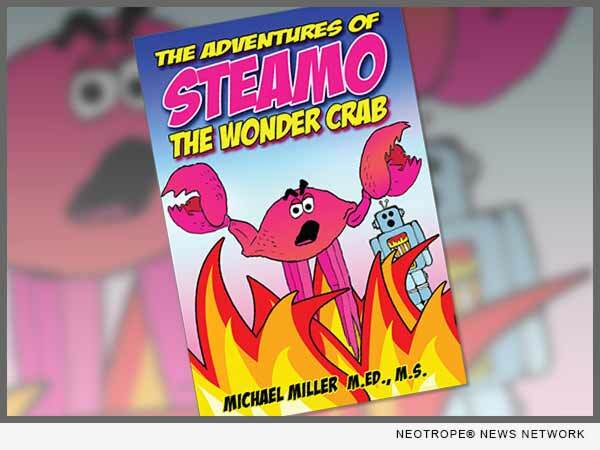 LOS ANGELES, Calif. /California Newswire/ — Pyramid Press (pyramidpress.net) announces the release of their newest book, “The Adventures of Steamo The Wonder Crab” (ISBN: 978-0989901796) by well-known educator and former college professor Michael Miller, M.Ed., M.S. “Steamo” is illustrated by Jeffrey Vernon and art director Minhee Choe. “The Adventures of Steamo The Wonder Crab” is the story of Steamo, a nine-foot-tall Magical Crab born in the waters of Fukushima, Japan in 2011. Steamo travels to America and along the way, acquires a sidekick, Soberanis; who is a 1950’s robot, found floating in the Gulf of Mexico. He brings Soberanis to Hollywood and together they have adventures, observe contemporary America and make new friends. Enema Greg and Nurse Barb are a few of the “stray dogs” that Steamo attracts and together they philosophize about life and teach lessons to the good and bad people they encounter during their travels. This book offers the reader insights into both philosophy and psychology. Steamo dispenses wisdom and aphorisms in an entertaining adult fashion to the reader. Although some would call this a self-help or self-improvement book, others would call it adult humor. Either way, every reader is certain to learn and enjoy Steamo and his odd friends as they explore and dispense unique insights. “The Adventures of Steamo the Wonder Crab” is available at http://pyramidpress.net/ or on Amazon. Steamo also has his own Facebook page which can be found at: https://www.facebook.com/steamothewondercrab/. Michael Miller has four college degrees, including two advanced degrees and has been an educator and teacher at the high school and college levels for over 30 years. He is a published author of numerous books, articles and DVD’s focused on self-improvement. * Shipping Weight: 1.1 pounds.